Subaru sprang into spring 2015 with the arrival of a vastly re-invigorated range of its established Forester range of medium sized 4x4 models, literally, I suggest, invading the Sports Utility Vehicle sector with what is now a civilised and sophisticated contender. Over about a decade Subaru has steadily shrugged off the working character of the Forester, this latest example convincing me that it was sufficiently smart, perhaps even streetwise to attract wide customer interest. Immediately I climbed into the driving seat I realised that the quality of interior trim and equipment specification was now to a high level, suitable say for a family user, an outdoor sporting type or simply a driver who seeks an effective vehicle to enable him/her to deal with winter time on rural roads or to explore some unbeaten countryside tracks and importantly with interesting driving characteristics. The heart of the Forester and for that matter all Subaru car products in a flat 4-cylinder ‘boxer’ engine, developed to provide the advantages of a low centre of gravity and also strong flexibility. This iconic engine has been developed over the years as both a diesel and petrol unit, both variants becoming more efficient and with cleaner emissions. My first experience with this year 2025 model is with the 2.0 turbo diesel version employing a 6-speed manual gearbox, though on some variants a state-of-the-art CVT (Constant Velocity) system is now available. Drive is to all four wheels, the flexible 148 bhp power output providing remarkably refined performance, notably when accelerating. I immediately noted the benefits of the improvements to the power unit that, as claimed, has reduced noise significantly, vibration and harshness while bringing fuel economy to a competitive level at around the 50 mpg mark according to use and loading. The driving position is comfortable almost in a cosy way with good vision, aided by a clear roar view camera and the fascia area is smart and easy to live with and highlighted by a new touch screen infotainment and navigation system. The front seats are power adjustable and have heating systems. I suggest this is the sort of overall driver comfort ideal for long sessions. Considering this is a good sized spacious five-seat vehicle it has very easy driving characteristics, relatively light yet with positive feel, smoothly effective all-disc braking, light clutch and steering, an accurate gear change though the accurate cross gate movement of the selector system varied from light to not so light. An important factor is that this latest Forester is uncannily quiet as a result of not only the mechanical refinements but the additional sound deadening. In fact the characteristic exhaust note the boxer engine is barely discernible –more’s the pity! The Forester has always been a good mannered machine on the road and this characteristic has been enhanced by regular development of the drive line which enables the 4-4-D system to work effectively in a smooth while the ride and stability provided by a well honed fully independent suspension system is notable. At motor way paces and with the cruise control in operation it is a civilised mile-eater. Overall performance is not bad either, top speed is a claimed 118 mph with 62 mph (100 kp[h) reached from rest in a respectable 9.9 seconds. This is a generous car in a number of respects – in no particular order it is strong on connectivity and infotainment, the build quality is most praiseworthy, the interior is practically designed with useful oddments stowage and the luggage capacity with just a tyre repair kit, is a massive 505 litres if loaded to the roof – 6/40 split fold rear seats provide useful load/person permutations and there are substantial roof rails. 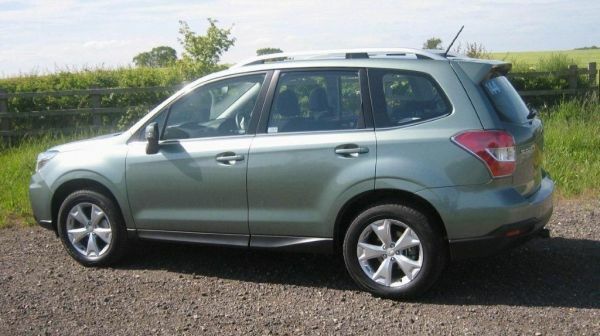 Be it around town, cruising a motorway or tackling some really rough stuff, this latest Forester serves well. Want more? Then there is the CVT automatic version or the awesome 240 bhp petrol turbo OXT in the line-up –the Forester is no longer lurking in the woods! MAIN RIVALS: Toyota RAV 4, Kia Sportage.